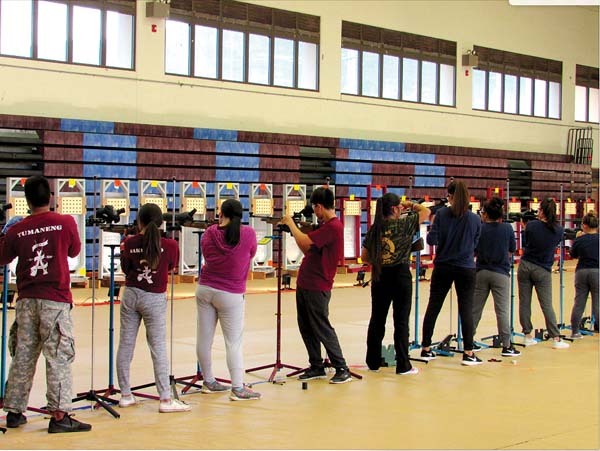 WAILUKU — Kody Cambra’s patience and focus were put to the test during the Maui Interscholastic League air riflery championship Saturday at Jon Garcia Gym. The Kamehameha Maui senior was placed in the third and final heat of day and that meant waiting — a lot. 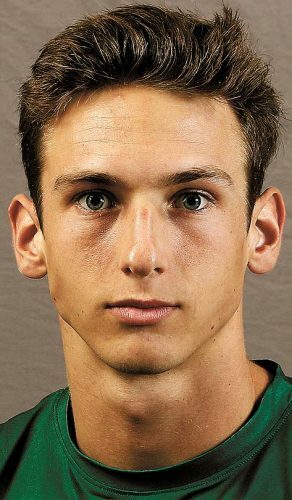 Almost five hours passed before Cambra was able to take his shot at a second MIL individual title, something he said made him focus more. While waiting, Cambra also resisted the temptation of seeing where his competition stood. 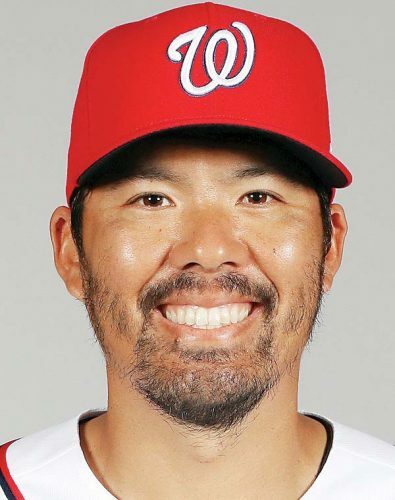 Cambra finished with a score of 533 to reclaim the MIL individual title — he placed second last season after winning in 2016. He finished 25 points ahead of Maui High’s Jordan Shim and 35 ahead of King Kekaulike’s Justin Kawamura. Cambra lead the Warriors to the boys’ overall team title — the Kamehameha Maui boys have placed first as a team and had the top boys shooter for four straight years. The Warriors finished with a score of 1,896, a mere two points in front of Maui High. Host Baldwin finished third with 1,806. 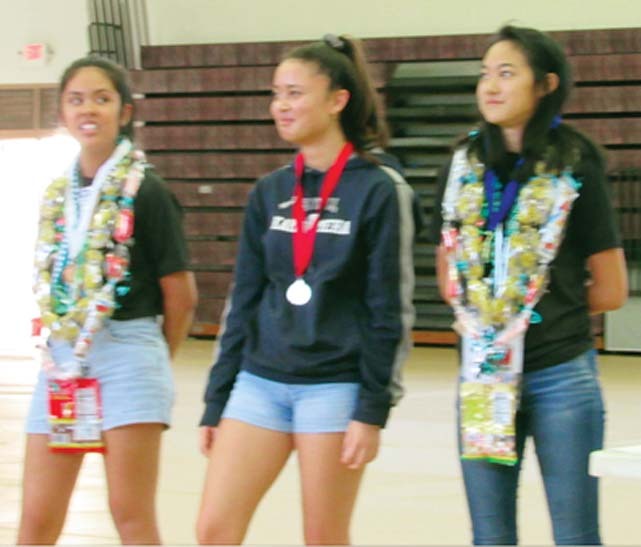 Playing the waiting game was a recurring theme for this year’s individual champions as King Kekaulike’s Keauli’i­okalani Nagata took the girls title with a score of 531 after competing in the third heat of the day. Like Cambra, Nagata also didn’t look at the scores before her heat started. Nagata bested Kamehameha Maui’s Kuualoha Bailey by five points and her King Kekaulike teammate Katebel Jose by seven. In the girls team event, Kamehameha Maui took the top spot with a 1,990 total. Maui High placed second at 1,981, and Baldwin third at 1,905. 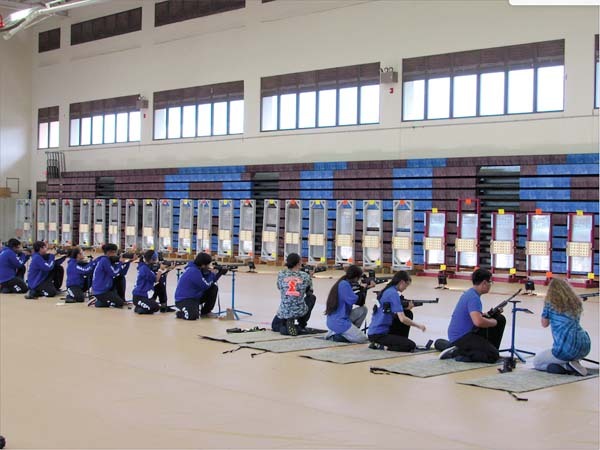 With its victory, the Kamehameha Maui boys team of Cambra, Joshua Grant, Gabriel Arcas and Koalele Spencer will be heading to the Civilian Marksmanship Program Air Riflery State Championships on Oct. 23 at the Blaisdell Exhibition Hall in Honolulu. Joining the Warriors at states will be Shim, Kawamura, Makali’i Sequeira (Baldwin), Reece Ugalino (Baldwin), Riley Williams (King Kekaulike) and Evan Aquinoe (Maui High). For the MIL girls, Kamehameha Maui’s team of Bailey, Bailey Ventura, Naliko Cabanilla and Teani Kaluhikaua will be joined at states by Nagata, Jose, Fiona McGrath (St. Anthony), Kamila Hera (Maui High), Venus Versola (Maui High) and Mikeala Kealoha (Baldwin). 1. Kamehameha Maui 735-602-666–1,990: Kuualoha Bailey 188-164-174–526; Bailey Ventura 186-157-152–495; Naliko Cabanilla 182-138-173–493; Teani Kaluhikaua 179-137-160–476; Nanea Ah You 168-143-159–470; Amoi Rutherford Storm 170-128-150–448; Kuumana Bailey 164-137-137–438; Ka’ililau Pu’u 173-115-143–431; Ku’umaka Ruidas 162-109-128–399; Karrisa Pond 153-106-140–399; Tatiana Soon 121-121-134–376; Isabelle Greig 160-84-127–371; Aleina Reyes 149-100-103–352. 2. 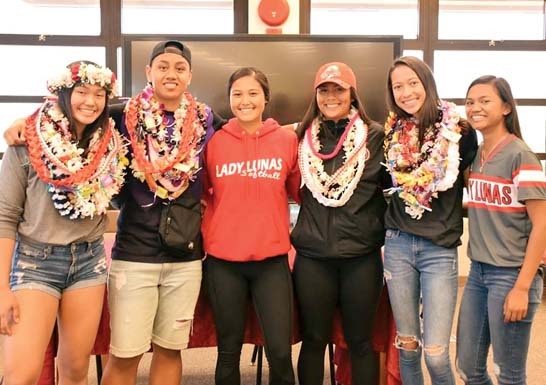 Maui High 752-597-677–1,981: Kamila Hera 190-140-182–512; Venus Versola 182-154-163–499; Kaitlyn Otani-Hernandez 171-144-171–486; Shmily Versola 193-155-136–484; Taylor McCary 171-144-160–475; Alexis Viloria 185-133-156–474; Jenna Payba 176-143-147–466; Jourly Versola 172-136-152–460; Jordyn Pagaduan 184-130-145–459; Angel Gragas 170-118-161–449; Shyla Orquia 166-101-143–410; Tamlyn Tashiro 157-110-128–395; Taylor Macias 142-126-112–380. 3. Baldwin 712-542-672–1,905: Mikeala Kealoha 193-138-164–495; Emi Sakumoto 176-139-179–494; Kaysha Villlaverde 173-138-162–473; Brielle Fernandez 166-127-150–443; Caitlin Ramiscal 158-118-167–443; Malia Kaiahua-Sato 165-124-140–429; Caitlyn Riopta 157-116-150–423; Lexie Galam 153-116-150–419; Aliyah Guico 170-103-145–418; Aeszalyn Ortogero 120-100-126–346. 4. Seabury Hall 713-520-604–1,812: Elena Hickey 181-134-149–464; Egesu Berkmen 173-129-154–456; Sierra Lewis 168-133-149–450; Taylie Kawakami 169-124-149–442; Alara Berkmen 180-113-140–433; Dyani Pierner 173-109-146–428; Eva Ponting 179-93-152–424; Audrey Ng 164-106-139–409; Alana Battad 153-117-125–395; Linda Schmitt 141-84-137–362. 5. 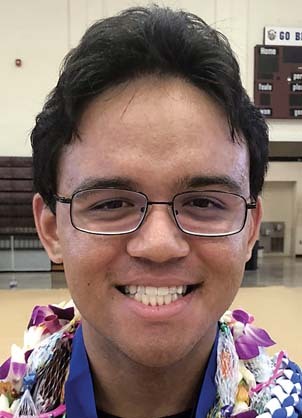 King Kekaulike 686-543-596–1,812: Keauli’iokalani Nagata 186-172-173–531; Katebel Jose 190-150-184–524; Kali Spalding 163-128-138–429; Alexis Camara 147-93-88–328; Jaylynn Poaipuni 115-71-101–287. 6. St. Anthony 333-295-327–955: Fiona McGrath 185-160-173–518; Brianna Leval 148-135-154–437. 7. Molokai 363-245-307–915: Maria Angst 186-127-169–482; Melody Kaili-Kalua 177-118-138–433. 8. Hana 139-125-118–382: Marley Moeai 139-125-118–382. 1. Kamehameha Maui 706-561-631–1,896: Kody Cambra 186-170-177–533; Joshua Grant 179-137-155–471; Gabriel Arcas 180-118-152–450; Koalele Spencer 159-136-147–442; Coian Hett 161-86-112–359; Jaston Patao 140-88-128–356; Jai Mashino 139-97-115–351. 2. Maui High 727-571-623–1,894: Jordan Shim 187-160-161–508; Evan Aquinde 177-133-156–466; Dane Payba 185-120-157–462; Davin Toguchi 178-133-147–458; Ronel Yadao 168-145-140–453; Issac Olsen 169-133-137–439; Chyler Bolosan 173-110-149–432; Bryan Pontanilla 167-116-146–429; Reynel Cariaga 170-122-130–422; Mason Bailey 164-115-142–421. 3. Baldwin 701-552-634–1,861: Makalii Sequeira 180-130-166–476; Reece Ugalino 172-150-153–475; Jaden Pladera 177-130-153–460; Chandler Tumaneng 162-135-153–450; Daniel Garcia 172-136-140–448; Cobby Carino 161-131-153–445; Charles Duarte 164-111-162–437; Jarin Tateishi 153-101-145–399; Aaron Nakamura 138-114-144–396; Shayne Enomoto 110-68-91–269. 4. King Kekaulike 671-516-619–1,806: Justin Kawamura 187-142-169–498; Riley Williams 169-147-158–474; Xaden Nishimitsu 170-114-162–446; Ely Lopez 145-113-130–388; Jonathan Lane 145-85-130–360; Estin Tantisira 97-91-98–286. 5. Seabury Hall 454-303-358–1,115: Bryce Tarpey 158-111-151–420; Barrett Barnard 158-104-104–366; Austin Lugo 138-88-103–329. 6. Molokai 338-224-283–845: Gavin Makekau 177-115-141–433; Charles Kamai-Cacpal 161-109-142–412. 7. St. Anthony 304-225-295–824: Max McGrath 153-123-150–426; Michael Vergel de Dios 151-102-145–398. 8. Hana 172-179-184–535: Kayden Kaauamo 116-104-102–322; Owali Moeai 56-75-82–213.